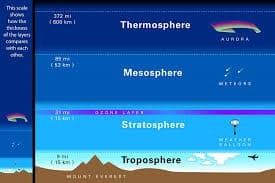 The Troposphere is one of the five layers of the Earth’s atmosphere, along with the stratosphere, mesosphere, thermosphere, and exosphere. 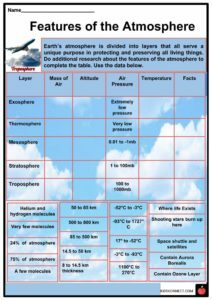 The Troposphere is one of the five layers of the Earth’s atmosphere, along with the stratosphere, mesosphere, thermosphere, and exosphere. It is the lowest and closest layer to the Earth’s surface. 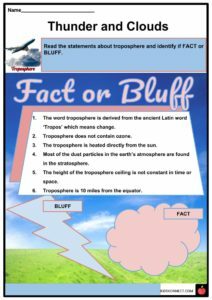 See the fact file below for more information on the troposphere or alternatively, you can download our 25-page Troposphere worksheet pack to utilise within the classroom or home environment. 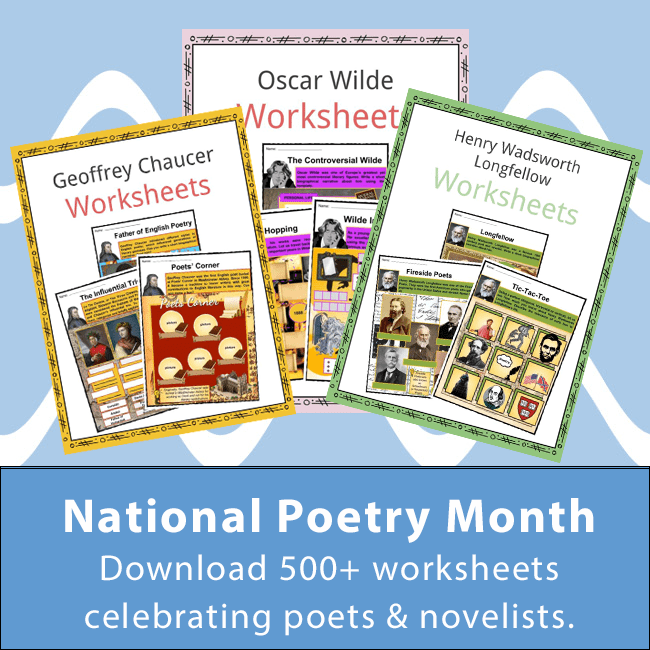 The word Tropos is the Greek term for “change”. Among the main feature of this layer is its changing weather due to constant mixing of gases in the atmosphere. The change in weather we experience daily all happens in the troposphere. This layer extends between 5 to 9 miles (8 to 14 kilometers) depending on which part of the Earth you are looking at. In colder regions, like the north and south pole, the troposphere is thinner. It contains three-quarters of the mass of the Earth’s atmosphere and is composed of 78% nitrogen, 21% oxygen, and a 1% mixture of argon, water vapor, and carbon dioxide. 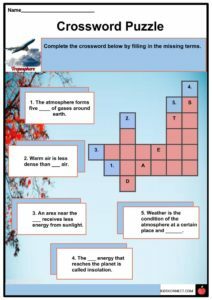 Air at the bottom of the troposphere or near the Earth’s surface is warmer, which means the higher the altitude, the colder it is. Due to its composition of water vapor and dust particles, most clouds form in this layer. Water vapor is greatest above the tropics and least in the polar regions. This layer is heated from the ground or ocean. Sunlight warms the ground or ocean, which eventually radiates the heat into the air above it. Tropopause is the boundary separating troposphere and stratosphere. Its height depends on the season, latitude, and whether it’s day or night. During winter the poles’ tropopause is lower – about 7 km high – and it’s about 20 km near the equator. The vertical transport of heat in the troposphere is called convection, while advection refers to the horizontal heat transfer. In densely populated areas, smog in the troposphere is commonly present. This feature is produced when pollutants accumulate close to the surface, plus a series of chemical reactions. 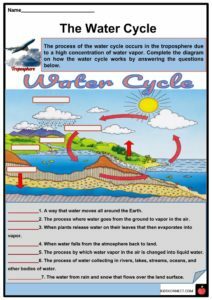 The water cycle or exchange of water between the Earth and the atmosphere also occurs in the troposphere. The water cycle in the troposphere begins when the sun evaporates water from the surface and gets transported to other regions by the wind. 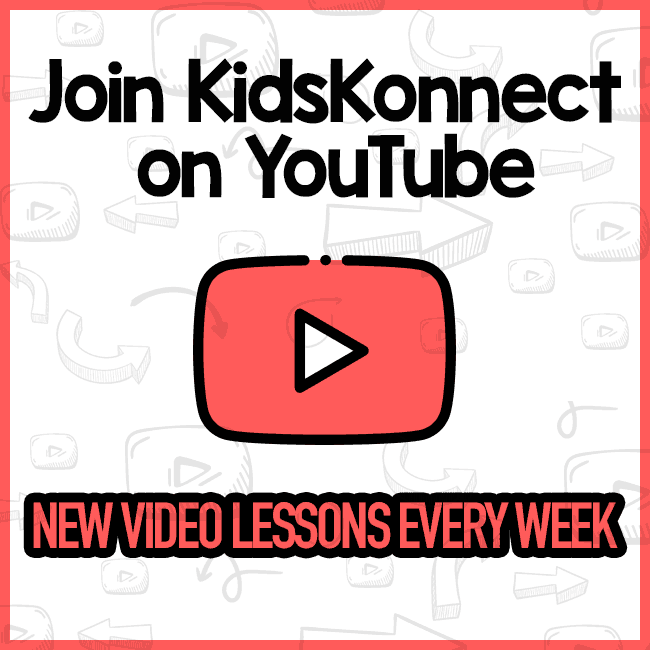 Air rises, expands, cools, condenses, and develops clouds. When liquid or solid particles collected are large enough in size, they fall towards the surface of the Earth as rain, snow, or sleet as precipitation, dependent on the air temperature. Despite their fluffy and cotton-like appearance, clouds are not weightless. A cloud is formed from a group of tiny water droplets in the air during the process of condensation. 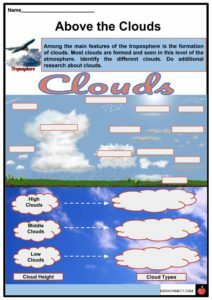 While most clouds form in the troposphere, some can be seen as high in the stratosphere or mesosphere. Some of the main types of clouds include stratus, cumulus, and nimbus. Stratus clouds are characterized by their horizontal layered sheets and grey or white color. They are the lowest lying cloud type, which are often seen as mist or fog. This type of cloud is accompanied by light drizzle and snow if the temperature is cold enough. Cumulus clouds are like cotton floating in the sky, usually seen in fair and sunny weather conditions. They can grow into towering cumulonimbus thunder clouds which produce rain showers. The high hair-like clouds are called cirrus clouds. They are the whitest clouds during day time and are often associated with a change in weather. In the first 500 meters of height in the troposphere, vertical, upstream, and downstream currents occur. These help in recycling air, dispersing pollutants, and the suspension of dust which causes the reddish color of the sky at dusk and dawn. It is commonly known as the dirty layer. Due to a high concentration of oxygen and water vapor in this layer, all living creatures can develop and survive. Greenhouse effect also occurs in the troposphere. The solar rays from the sun are trapped in this layer which warms the temperature and makes life possible. In addition to being the thinnest layer of the atmosphere, it is also the most turbulent. This is the layer where planes can fly, but the cabins must be pressurized due to lack of oxygen and extremely low temperature. This is the same reason why mountain climbers carry bottles of oxygen in high altitude courses. 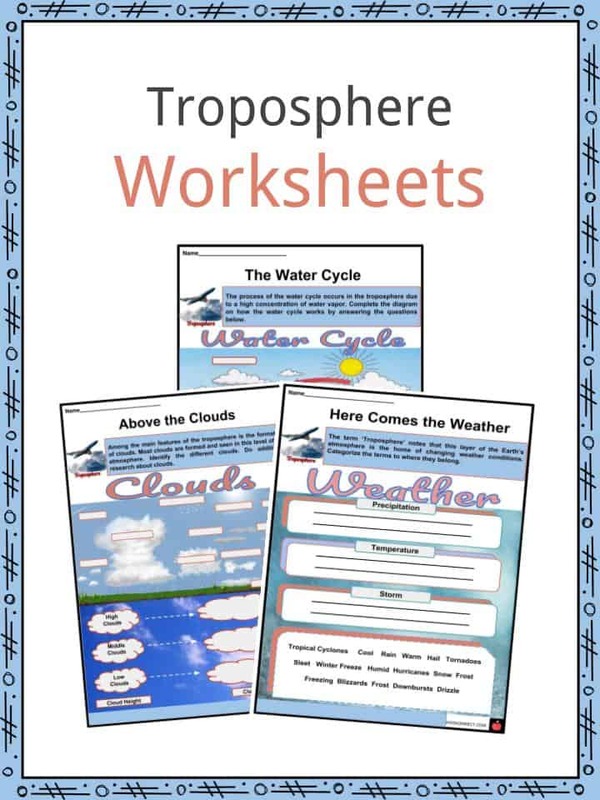 The troposphere regulates temperature and produces weather. Weather encompasses all short term atmospheric phenomena on Earth, while climate usually lasts significantly longer periods, like seasons that last a quarter of a year. 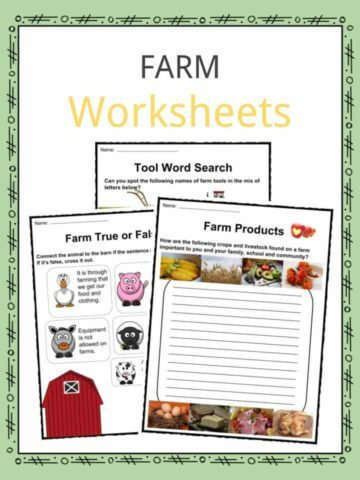 Change in weather is generated by many factors including air, sunlight, mountain, and clouds. Despite its dynamics, weather can be predicted through forecasting. For average people, weather forecasting can be done by observing the type of clouds and their movement. While professional forecasters use a variety of tools, like balloons and radars set up in weather stations. 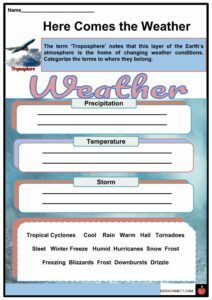 All weather phenomena, including hurricanes, tornadoes, thunderstorms, typhoons, cyclones, and snow occur in the troposphere. 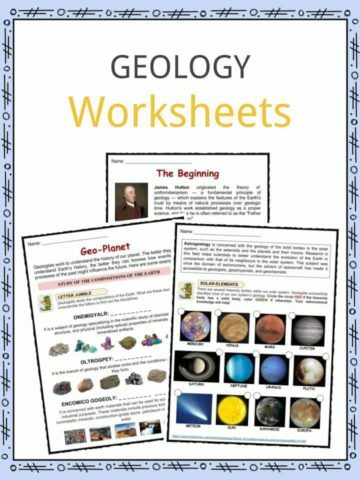 This is a fantastic bundle which includes everything you need to know about Troposphere across 25 in-depth pages. 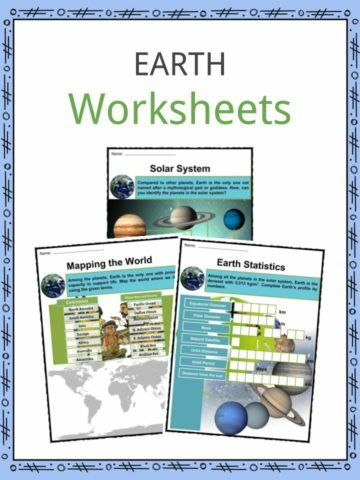 These are ready-to-use Troposphere worksheets that are perfect for teaching students about the Troposphere which is one of the five layers of the Earth’s atmosphere, along with the stratosphere, mesosphere, thermosphere, and exosphere. It is the lowest and closest layer to the Earth’s surface.